In an effort to expand my root beer collection in an affordable manner (have you ever ordered one variety online before?) I decided to try trading with other root beer reviewers. 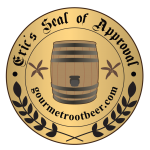 I looked first to Anthony of root beer barrel fame because he’s the undisputed king of root beer reviews and also his was the first site I encountered way back in 1998. I’d always looked up to him and since he is on the other coast, we each had access to different regional varieties. After a brief email exchange, the trade arranged. Sadly, i’d given him the wrong zip code since I had recently moved. The package was lost in the mail for over two weeks. Thankfully, he’d gotten a tracking number and I was able to sort it out. The one I was most excited to try was this one. I mean look at it. Bullet holes through the label with a cowboy holding a frosty mug. How can you not like that? It’s also made “with pure cane sugar.” What’s not to love? It has a very rich and creamy Body. It has an excellent sassafrass flavor, how a root beer should be. The Bite has a good spice tingle as well as some from the carbonation but stays on the smooth side as I like it. The Head is medium height and decently frothy. It fizzes down faster than I prefer but it is sufficient. The Aftertaste is wonderful. Creamy vanilla and a caramel flavor with hints of anise and wintergreen. This is one quality brew! It’s core flavors are near perfectly proportioned and then its got nice extras from the vanilla and the spices. After the first half a mug, I knew this would be getting a Seal of Approval. Thankfully in this case, I have to drink two bottles, just to make sure. The biggest problem I see with this, it isn’t sold locally. See how it rates against other root beers.